The correct (intended) phrase is “should have” or, in contraction form, “should’ve”. The sound of the contracted form is most likely the cause of this common confusion. 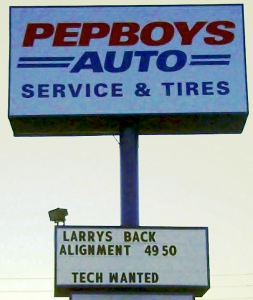 Larry can perform Back Alignment while you get an oil change? In a major magazine I read an advertisement that blatantly misused (rather confused) the two. This is a difficult one and I often find myself confused and puzzled on it. The former are small snippets found in the Bible. The latter is used to compare two (often opposite) things. Weather relates to storms and temperature such as WHETHER you take an umbrella with you. “I could care less”, “Irregardless” and “Unloosen”. The intent of the phrase, “I couldn’t care less” is that you care so little there is no room for you to care at all. “Regardless” means, literally, without regard. So, “Irregardless” (besides not even being an English word) would be a double negative. The same with “Unloosen”. And, while we are on the subject, it seems very difficult to remember that misplacing or failing to continue to possess something is to LOSE it. “Loose” is what you do when you untighten. When you hear a newscaster talking about a criminal who has barracked himself from the police, he is not said to be “Held up” or “Hold up”. The proper phrase is “Holed up”; like a rabbit in a hole. And the place in the bank for valuables; a BOX that is locked in the SAFE for you to DEPOSIT your special valuables is a SAFE DEPOSIT BOX. I suspect that because slurring the words sounds like “Safety Posit Box” this mistaken phrase has been promulgated. “If you have any questions just contact Mary Sue or myself”. Why are we so afraid to say ME? It is not a curse word. “You are welcome to go to the movies with John and me.”, is the correct grammar. If I am the object of the sentence it should be “me”. “John and I are going to the movies tomorrow.”, demonstrates the common situation where I am the subject. I do not profess to be perfect when it comes to grammar. But I feel compelled to strive for perfection in my communication skills, and I encourage also. We are blessed with a language that provides a rich vocabulary, enabling the selection of precisely the optimum word for the occasion. Again the “E” is related to an Event; something that occurs in time. Moreover, the “A” reminds me that his applies to something ACTIVE that I can do. I can AFFECT something and then I will (at some point in time) see the EFFECT of what I did. I remind myself that if there is a storm coming, “Get The ‘H’ out of there!!”. That is why WEATHER has no ‘H’ after the W.
Try the sentence without the other name and see how it sounds. Using the examples above, “You are welcome to go to the movies with John and me”. Here “I” would simply SOUND wrong.